Aspen must be the only tree which is best distinguished by its voice. When I was walking along the path to Castle Lachlan last summer, I stood and listened as a wave of sound spilled through a stand of beautiful tall trees, sweeping from one side to another and setting up the most beautiful whispering, like a broken wave sweeping over the shore. The leaves of aspen seem to have a particularly flexible attachment to the tree, allowing them to flutter and rotate in response to the slightest movement of air. But even on a still day, when not a leaf on the other trees is moving, an aspen will be dancing to its own secret song. A member of the poplar family, European Aspen (Populus tremula) is widespread throughout Europe, but is more common in the north of Britain than the south. As one of our native trees it is an important species in the Caledonian forest, tolerating a wide variety of soils and climates. It grows at elevations of up to 1,800 feet in the Scottish Highlands, and it occurs even in the windswept islands to the north and west. The leaves are rounded and small, usually only about an inch across, and their margins are lightly notched. A fresh bright green in early summer, they turn brilliant yellow in autumn, making the tree look like a tongue of flame. It’s not all that easy to identify an aspen just by sight, unless you are familiar with the leaves. The trunk is slender and silvery grey with branches pointing noticeably upwards, as if reaching for the sky. 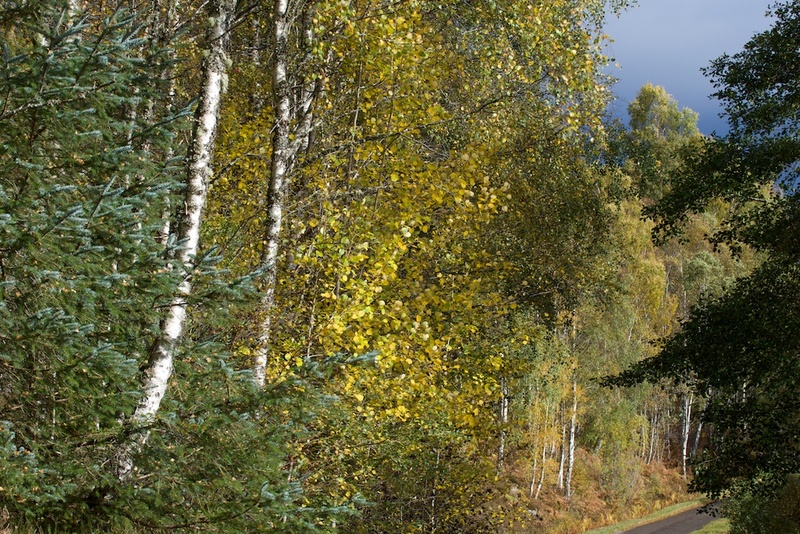 Birch trees can look very similar, but their leaves have a more definite point to the tip. Aspen trees are either male or female, with both producing catkins in March or April. Pollinated female catkins ripen and release tiny seeds, but in Scotland seed production rarely occurs, for reasons that are not yet properly understood (Trees for Life). The aspen can reproduce in another way, however, through suckers or ramets which spring from its extensive root system. While the trees themselves are short-lived, aspen roots can stay alive underground long after the parent tree has died, allowing the species to reappear in places where it has been absent for some time. 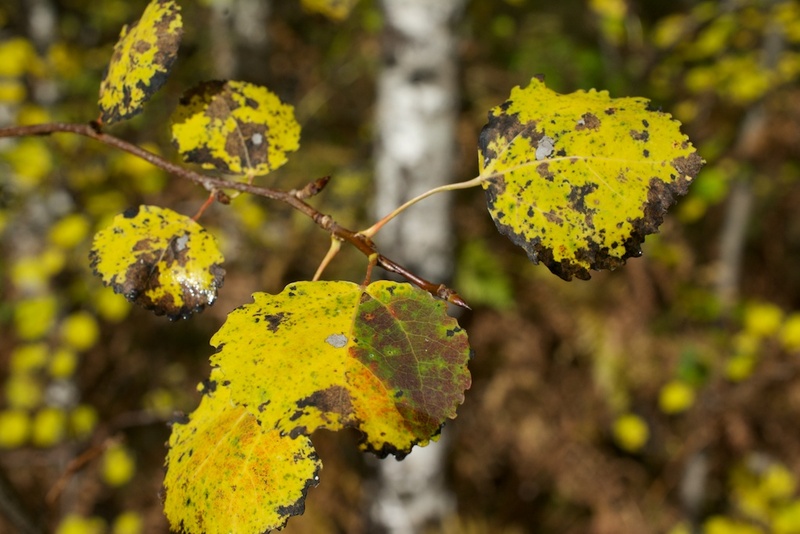 This remarkable ability allows them to survive forest fires, and the aspen is one of the pioneer species that will move quickly into cleared areas and start to regenerate the forest. 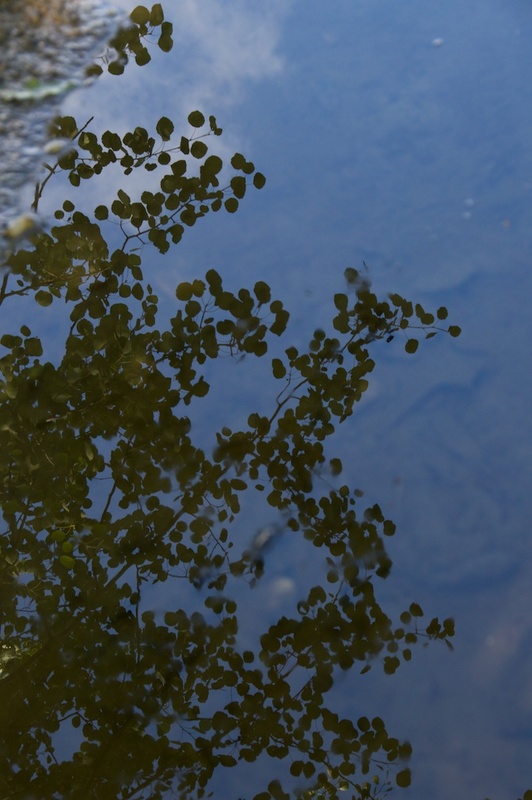 Recent scientific research has yielded some amazing facts about aspen groves: all the trees remain interconnected through their roots, making one single organism which is called a clone. They are either all male or all female, and come into leaf at the same time each spring. In the Fishlake National Forest in Utah, a colony of quaking aspen (Populus tremuloides) consists of around 47,000 male trees with identical genetic markers, and the grove is considered to be 80,000 years old. 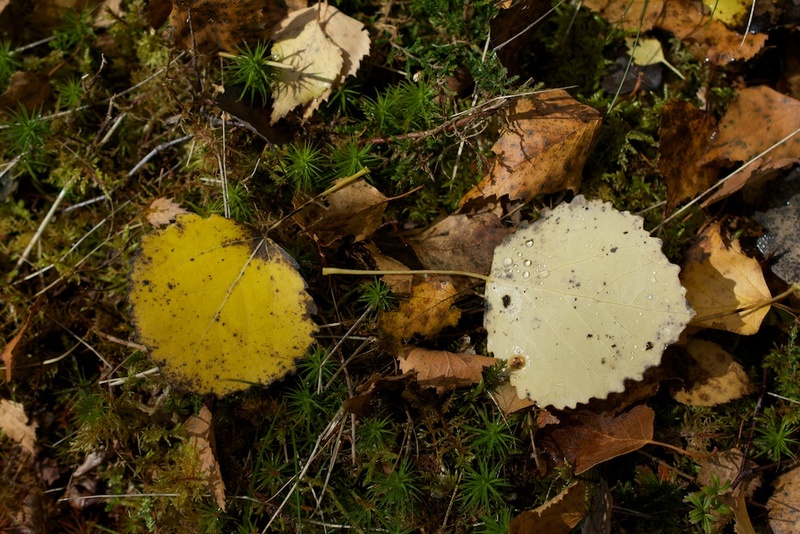 On the ground beneath an aspen grove the vegetation will often include heather, blaeberry, grasses or bracken, and several species of lichen grow on its bark. Over 60 types of insect feed on its leaves, some of them specifically dependent on the aspen, and in this way it also supports the birds that feed on the insects. Red deer graze on its leaves, and it is a favourite food source for the European beaver. Aspen wood is flexible and light in weight, making it ideal for use in arrow shafts, and many examples were found on the wreck of the Tudor warship Mary Rose. It has also been used for oars and paddles, but its comparative softness gives it a limited scope for building. It’s therefore surprising to learn that it was once a favourite wood for making shields, which would surely need to be strong and tough. But the reason lies in the lore of the aspen: like the hawthorn, it was thought to stand at the threshold of the underworld, and it was said to help overcome fear, offering courage to warriors in battle so that even if they died, their soul would be safe on its journey to the spirit realm. It is a lovely thought, that the tree whose trembling habit is often used as a metaphor for terror should actually assist us to recognise and let go of our deepest fears. Carrying this idea further, aspen trees were sometimes planted close to a dwelling for protection (like the rowan), and they were once thought to grow over buried treasure. Communication seems to be the aspen’s special gift, and in the past people have sought messages from the spirit world in the murmuring of its leaves. The sound rises and falls like a passing shower of rain, and you can’t help but stand still and listen, aware of some kind of sense within you that hears something beyond words. The song of the aspen is joyful and uplifting, inviting us to tread lightly on the Earth and listen to its gentle voice. Lovely lovely post, I so like learning about trees. Thanks. Thank you! 🙂 I love finding out about trees as well, particularly the folklore attached to them. Beautiful. Colorado is famous for its many aspen trees. Thank you, Susan! Ah yes, I’ve heard that – I bet they are absolutely beautiful. Nature is a brilliant designer! Obviously that aspen had ambitions to be another mega-colony! Very true, Pat. Thank you! There are Aspen in my front yard. My Dad and those in his generation here referred to them as “Quaking Asps”. “Aspen” is also the name of my grand daughter. I like Aspens very much even if they are not so popular here where we live. Another eloquent piece – a joy to read! Thanks Jo! Another fascinating tree post. I’m sure I must frequently have mistaken aspen for birch, because I don’t think of it as a common tree in Scotland. I like the idea of it having a special gift of communication. Lovely photos, Jo. Thank you, Lorna! I think I have probably done the same, and I wouldn’t want to have to tell them apart in winter. I am certainly noticing more aspen now, but I’ve never seen big stands of them – only a few trees together.